This was a great commission… our clients in Bristol who commissioned the Wow Wall 3 needed some shelves for a gap between their kitchen wall units and gave us free reign to come up with a totally new design for them ! 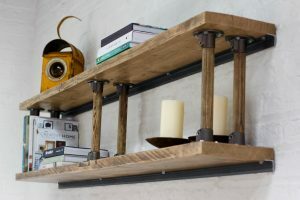 We wanted to use the reclaimed wooden ladder rungs again, so this time we used them as risers in-between the shelves attached with our dark steel fittings… they fit these fittings perfectly ! The shelves are attached to the wall using dark steel angle iron brackets….